There are many reasons to need to learn how to be efficient when concrete saw cutting, such as when you need to correct issues or remove excess material. If you forget to add the stress joints or want to create a different look for a new patio, cutting the concrete is the fastest way to achieve your goals. Of course, it’s not just as easy as grabbing a saw and making the cuts. Put these handy tips to good use during your next concrete cutting task. Wet Saws: A constant spray of water dampens down dust and cleans the cutting area so you can see what you are working on. Diamond Blades and Bits: Diamond drills and saw blades make the cleanest, sharpest cuts for fine work and attractive details in a decorative project. Walk-Behind Saws: When an entire slab or wall needs removal, these large saws handle it the fastest. Handheld Cutting Edge Saws: Tackle tough corners and embedded rebar with a flush-cutting saw. Grabbing the right saw allows you to cut concrete and a dozen other materials by simply switching out the blades or cutting heads. 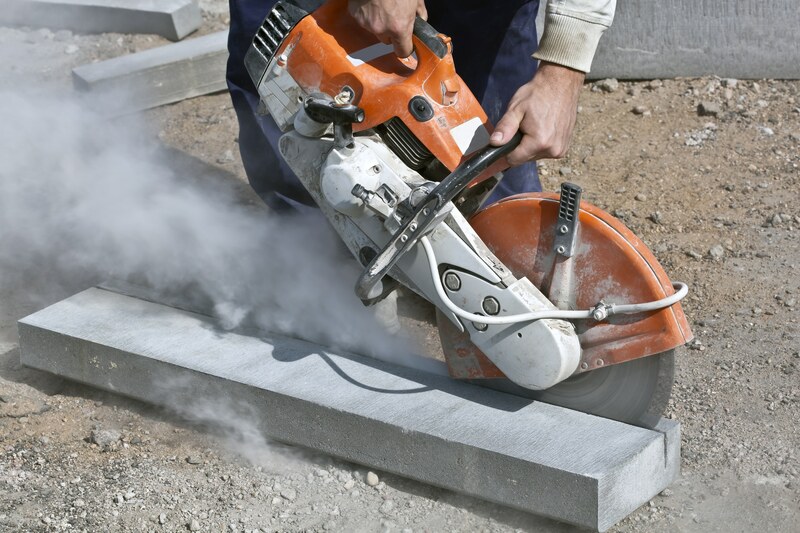 Cutting concrete with a dull blade increases the chances of fracturing. It also heats up the saw, which can shorten its lifespan, and increase the amount of dust produced. For clean cuts in one pass, swap blades as soon as they show minor signs of wear. Invest in heavy duty blades when you plan to do a lot of concrete cutting at once. This will prevent you from having to stop and change blades as often. Just like the saws that run them, concrete cutting blades are not created equally. A diamond coated blade performs better in reinforced concrete, but you may need a wet blade for an area more sensitive to dust. Packing a variety of different cutting blades in your toolbox is the best way to get the work done without multiple trips to the hardware store. Do you know where the pipes, rebar, and wiring are embedded in the concrete? If not, you should do all your cutting with a blade capable of sawing through these materials, or only cut vertically at a height you know stays well above the depth of the other materials. Invest in wet cutting equipment when you are working on interior projects like concrete floors and countertops. The water greatly reduces the amount of dust flying around and coating everything in the house. Of course, wet saws also work wonders outdoors too, but only when all sources of electricity in and around the concrete are cut off first. These saws make the work safer for you too, and reduce the number of respirator refills you need. Finally, try to time your cuts for the perfect moment in the curing process. Wet concrete is practically impossible to cut without fraying and splitting, but completely dry and cured concrete also fractures at the surface when cut. Aim for the day when the concrete is fully hardened but only about half cured. This means the texture is perfect for getting smooth edges and straight cuts with minimal dust. For more tips when working with concrete, make sure you check out more of our concrete tools for your project’s needs.